How many of you have seen “A Charlie Brown Christmas” more than enough times in your life, so much so that you are able to recite all of the lines by heart, in addition to the jingle and lyrics to the tunes? Well, this coming Christmas, if you know that this show is going to get a rerun on your local TV channel, you might as well play along with the rest of the theme – by busting out this $199.95 Peanuts Animated Christmas Tree instead of using a regular Christmas tree, or one of the stranger types that we have covered like the Portal Christmas tree. 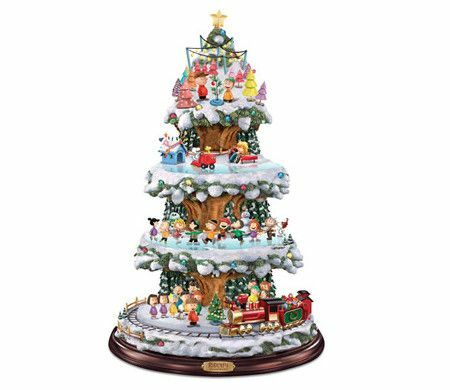 The Peanuts Animated Christmas Tree will be special in its own way, since it will feature the likes of the well loved Peanuts characters including the main man himself Charlie Brown, alongside Linus and the rest of the Peanuts gang. All of them will encircle the tree in full holiday revelry, while located at the base would be Snoopy driving a train that will carry its precious cargo of wrapped gifts, dolls, and stuffed animals, whereas the second level would have Pigpen, Violet, Sally, and others skating on an icy pond with their hands locked together. Right at the top of the tree, you will find best friends Snoopy and Woodstock driving a zamboni as Schroeder composes his concerto on a baby grand piano. The tree plays music from Charles M. Schulz’s Peanuts Christmas special, while the star tree topper is capable of casting a warm holiday glow. All of them will be hand painted, making it a truly unique purchase. Just make sure you have enough AA batteries to run it over the holiday season just in case the trio of them run out halfway.